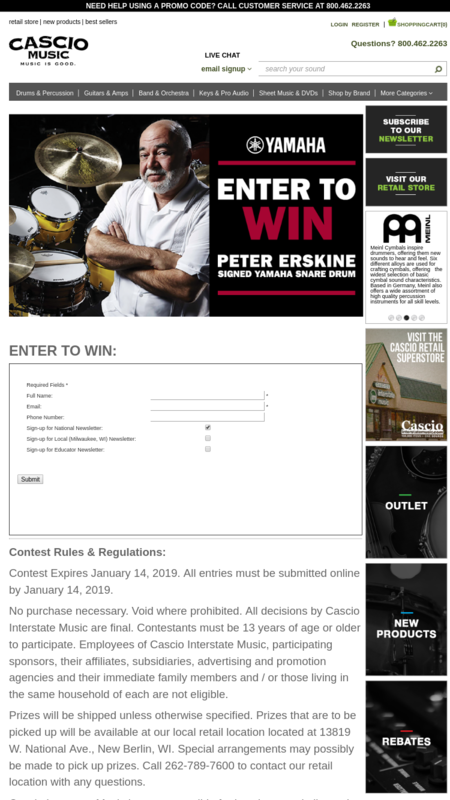 Contest Expires January 14, 2019. All entries must be submitted online by January 14, 2019. Since 1887, the Yamaha Corporation in Japan has grown to become the world’s largest manufacturer of musical instruments. Musicians worldwide place their confidence in Yamaha Drums, Keyboards, Woodwinds & Brass, plus Live Sound and Recording Gear. Archer offers Acoustic, Electric and Bass models – quality instruments with “sound” value at modest prices. Designed and performance-tested in the USA, these are ready-to-go right out of the box! With Archer, you’re not paying for the “name,” you’re paying for the guitar. Union Drum Sets are designed and performance tested in the USA … and come with everything needed to start playing, right out of the box. Quality Drum Hardware and Hand Percussion round out the Union Drums line. © 2018 Cascio Interstate Music. All Rights Reserved.